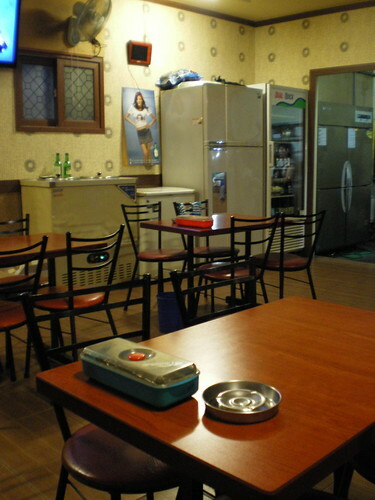 I visit Daegu twice a year and 청주버섯 (Cheong-ju Mushrooms) is always high up on the list of places to go back to. 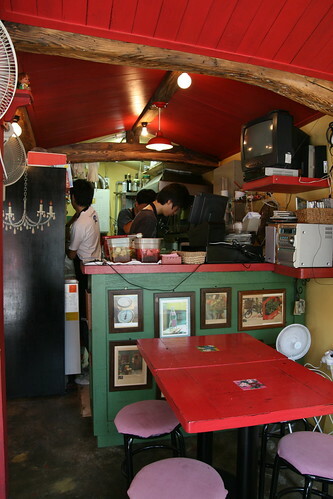 This "mushrooms house" offers you a range of fungi friendly dishes at very reasonable prices. At 8,000 won the 생버섯전 ("grilled ungrozen mushroom pancake"... by "ungrozen" I think they mean fresh...) is a gorgeous melange of many different mushrooms (five at a guess, but it could be more). Crispy, chewy and everything that a pancake should be. Delicious. 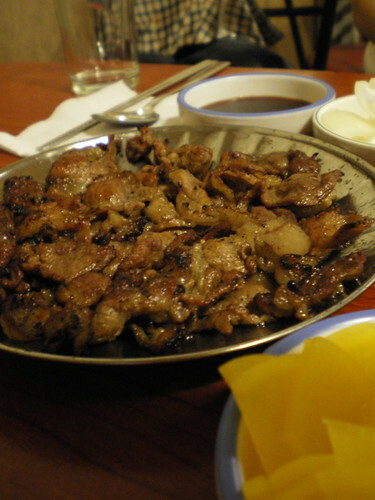 10,000 won buys the "small" portion of 버섯탕수 ("fried mushroom with sweet and sour sause"). 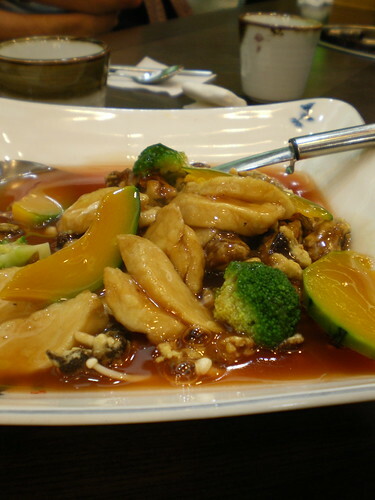 An homage to this chinese restaurant standby, the battered mushrooms are quite meaty and the thick sauce compliments the tasty morsels well. 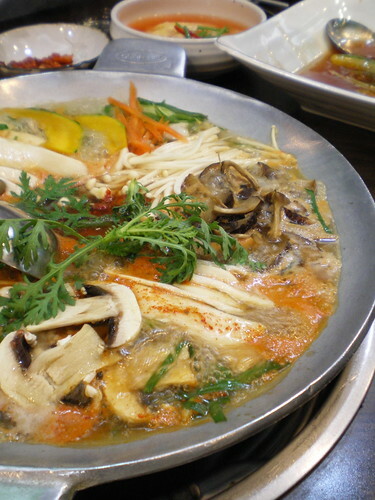 And last but not least the 생버섯전골 ("mushrooms casserol") at 9,000 won per portion. We ordered two and were treated to a beautiful mix of mushrooms in a spicy sauce. 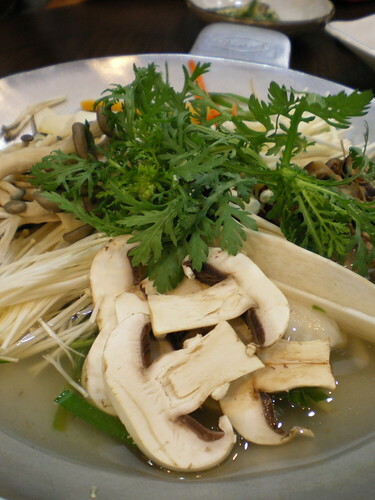 Cooked at the table, the stew doesn't take long and the combination of mushrooms, fresh greens, beef and glass noodles makes for a good finish to your meal. 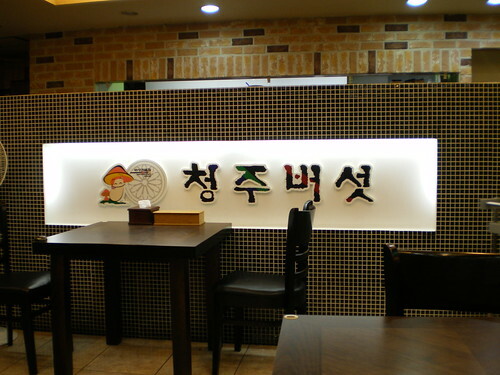 Located in the heart of Daegu, it's a convenient place to stop off for dinner for those of us with a passion for mushrooms. 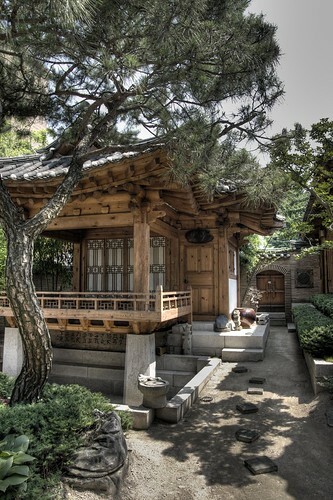 If you speak Korean give them a call on 053 425 5668. 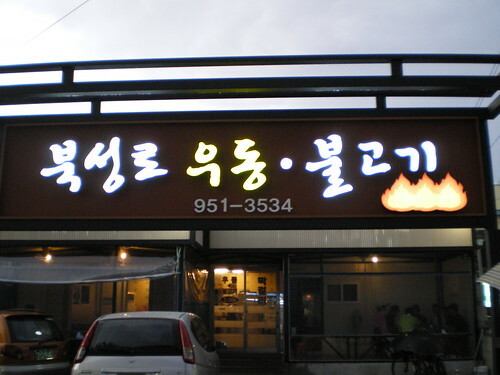 The pork is twice cooked (pre-prepared and then grilled to order) and has an exquisite charred smokey taste. 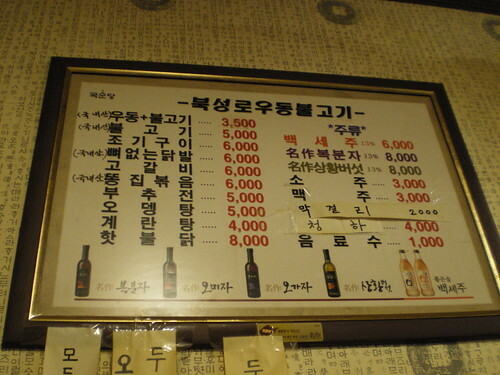 You don't get a whole lot for the cheap, cheap price, but for a mere 5,000 won you can get an extra plate (pictured above). 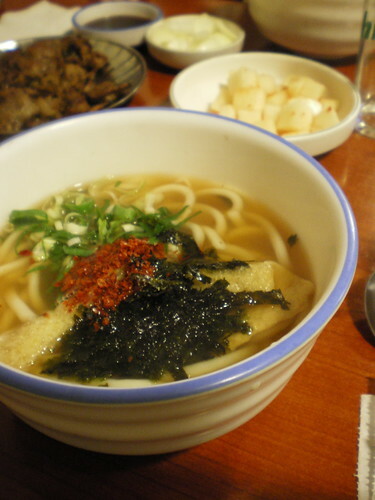 The udong noodles are fairly standard, but the broth is homemade and comforting. It feels like home cooking and the combination of grilled pork and broth works very well. 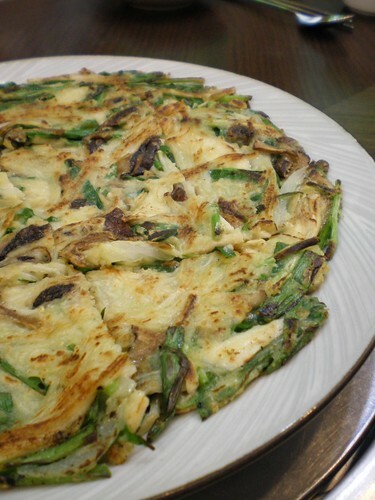 We were greedy and ordered the 부추전 (chive pancake). 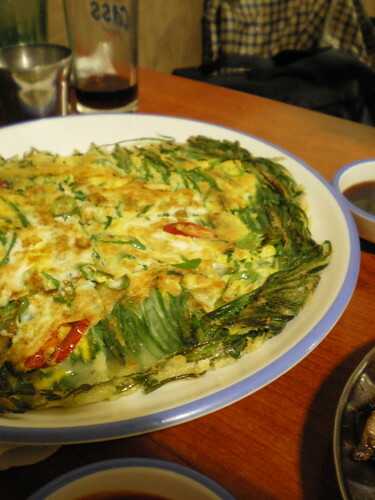 5,000 won for a glorious mess of egg, batter, chives and chillies. 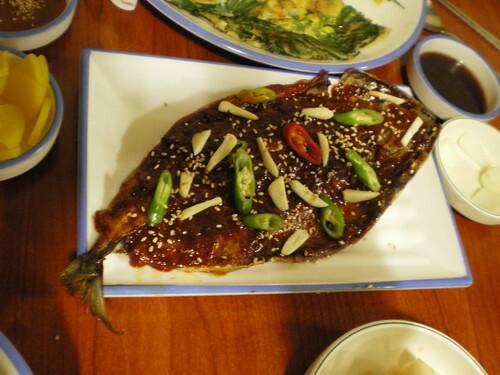 Plus we went on to get the 고갈비 (6,000 won), a spatchcocked mackerel, grilled to perfection and then smothered with sweet chilli sauce, raw garlic and chillies. Not too spicy, the sweetness of the gochujang works well with the salty mackerel creating a rather addictive fishy addition to the meal. 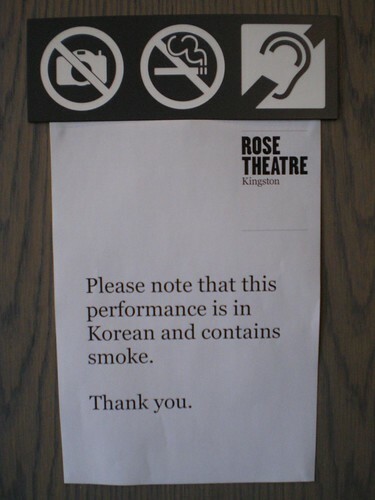 Found on the doors to the auditorium at the Rose Theatre in Kingston On Thames. Touring theatre life is generally fairly full on and the past few days have been no exception. So I decided that instead of the normal tea and toast, rather extreme measures were necessary to cope with the fatigue that comes with 14 hour days, little sleep and large amounts of jetlag... 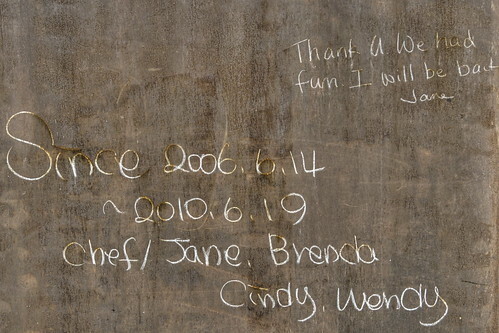 Unfortunately the accommodation we are staying in is rather bare so improvisation and compromise are the keywords of the day. 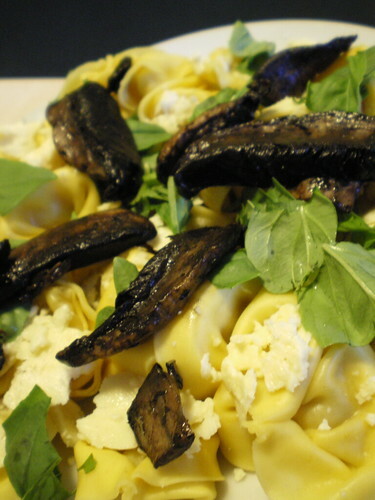 I present to you, ladies and gentlemen, the breakfast of surtitlers: Four cheese tortellini with slices of fried portobello mushroom, ripped basil and scatterings of cheshire cheese. '"Romeo and Juliet" performed by Mokwha Repertory Company at The Rose Theatre in Kingston on Thames starts tomorrow (Friday 16th July) and runs through till Sunday 25th July. Tickets are still available and surtitles are provided by Paul Ajosshi himself (I take full responsibility for all mistakes, mistranslations and bizarre errors). For the even more adventurous of you, next Tuesday (20th July) there are two performances of Mokwha's Zombie Soldier Children's Musical "My Love DMZ", again with English surtitles (once again I take full responsibility for any errors, I'm a sucker for punishment). I'll be around over this weekend supervising surtitle operations and would love to see any of you, your friends or family who may wish to watch one of the best adaptations of "Romeo and Juliet" around. 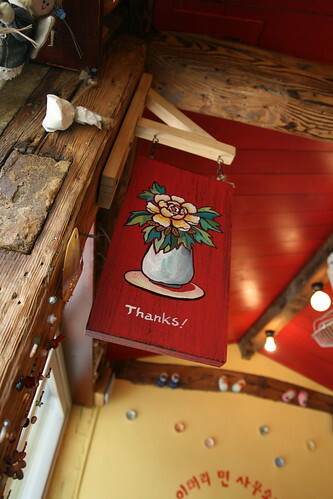 I discovered a delightful tiny Italian restaurant yesterday on my way to the Arirang tv shoot. 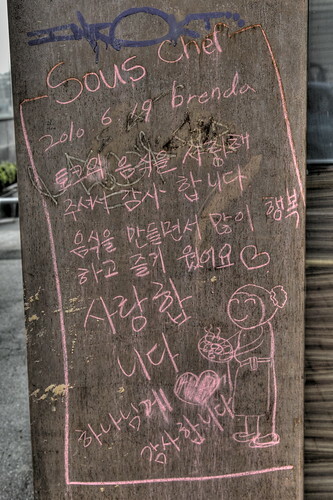 Hidden away in the backstreets of Bukchon Hanok village is 이태리 면 사무소 . 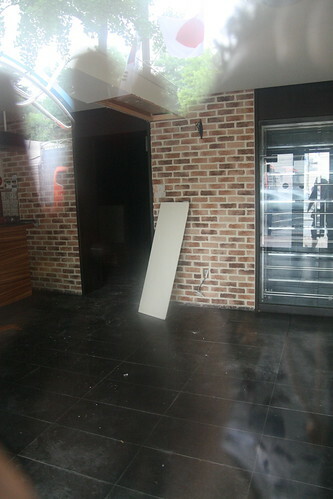 This miniscule hole in the wall spaghetti house offers you a choice of the usual suspects when it comes to Italian food. 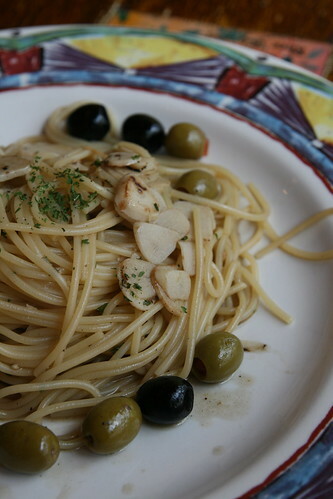 I went for one of their summer specials: the "aglio e olio" for 7,500 won. 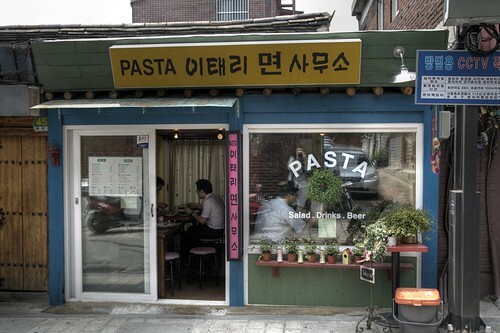 I think the simplest pastas are often the hardest to perfect, but this small restaurant did not disappoint. The spaghetti was spot on, the garlic was perfectly cooked and with a little fresh parsley and a lot of olives it was a satisfying plate of pasta. You can call them on 02 3676 0233, be prepared to wait a little while to get a table in this tiny, yet perfectly formed Italian joint. 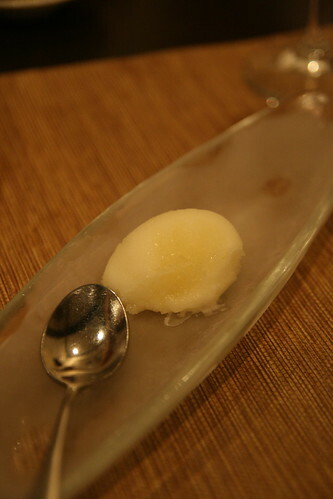 Last month my father rolled into town on business and we decided to use this as a good excuse to head out to OKitchen2 to try their latest culinary concoctions... What follows is evidence of our visit. 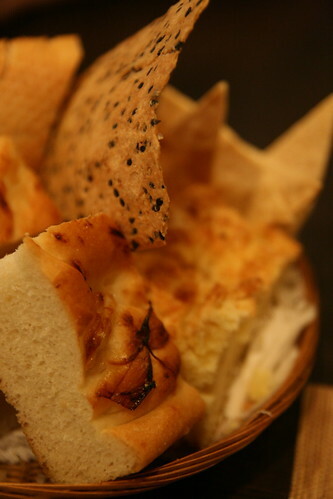 Bread, my delicious wheat based addiction. The always welcome fish plate. 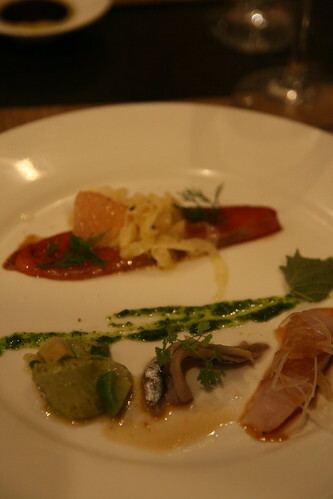 Clockwise from top: Smoked salmon with a citrus and fennel sauce, croaker sashimi, anchovy ceviche and halibut and avocado ceviche. the halibut won hands down. 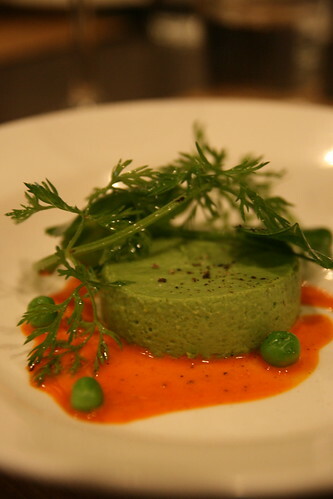 Next up, pea flan with a carrot and cardamom sauce crowned with carrot tops. 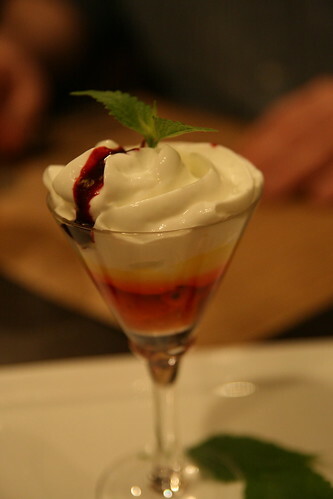 I'm not a huge fan of flan, but I was impressed with the crunchy carrot tops. First time I realised they were edible... Oh, the naivety! 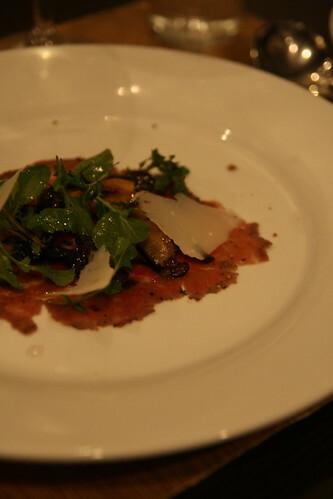 Beef carpaccio with assorted mushrooms and truffle oil. Heavenly raw beefiness. 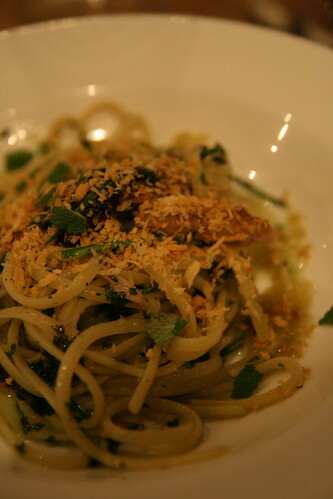 Linguine with grilled saury and kennip pesto. Delicious oily mess of fish, breadcrumbs and perilla leaves. 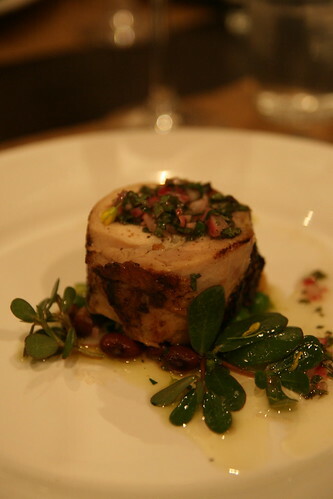 Chicken roulade with salsa verde. Perfectly cooked. 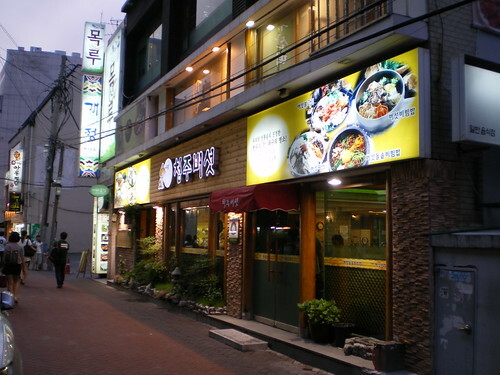 OKitchen2 is just down the road from Itaewon station, head towards Noksapyeong and turn right at the first set of traffic lights. 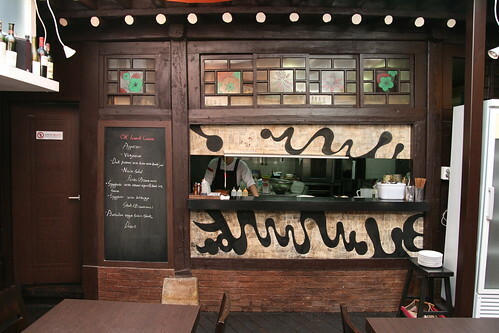 The restaurant is just a few metres down the alley on the left hand side. Call them on 02 797 6420 or visit their website here. 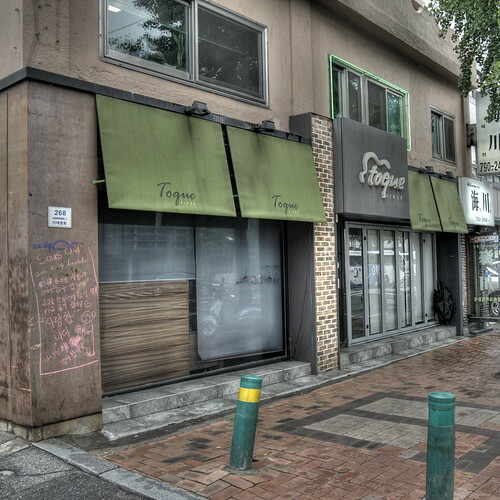 Walking near Hangangjin station on Friday, I noticed that Toque was looking a little worse for wear. 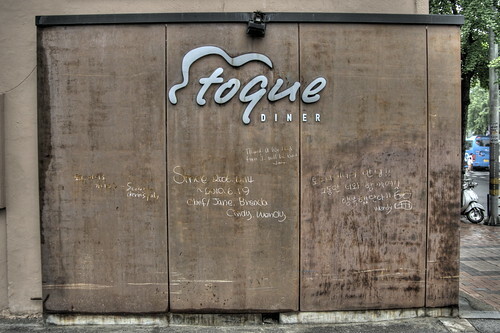 On closer examination the restaurant seemed to have been gutted and judging by some of the messages on the wall, it seems likely that Toque has shut down. 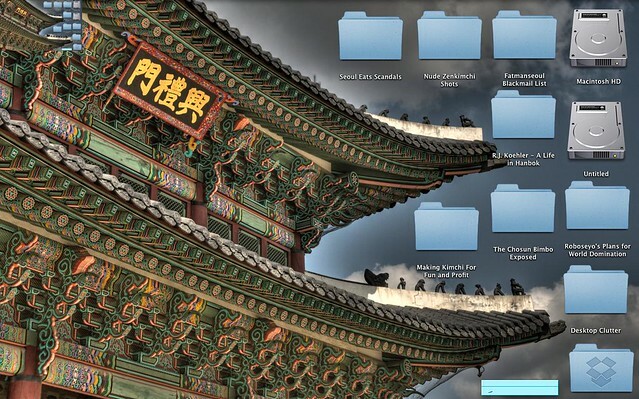 Goodbye to this little slice of Americana in Seoul.